This is topic Ligonie OSM 950 in forum 9.5mm Forum at 8mm Forum. Have you seen this jewel? Optical and magnetic audio in a sigle projector, and also the possibility of recording! A very rare mix on 9.5mm machine! The auction started from 0 euro, I thought I could make an offer, but the offers reached stratospheric levels. Not a lot more than a good Buckingham conversion which itself could be a better bet in the long run. Maurice, a positive thing of this projector is the fact that is native in 9.5mm, but it's true that a converted Buckingham is excellent in the same way. Anyway, auction closed at very high price! Very good machine indeed but some models have a system to hide the optical soundtrack, others no. And the optical sound films will have a reverse picture. Luckily, the projector usés Eiki lenses so you can put a reversing Lens. Sold for 1810 EU. Unbelievable. Dominique tells us that it doesn't even have its sound optics on the correct side to play optical prints. A great shame. I wonder if the bidders, and the eventual buyer, knew of this anomaly. Yes very disappointing. You would have thought that, being a dedicated 9.5 projector, the designing/manufacturing team would have got the sound optics right. The price reflects the fact that not many projectors like this surface often. It seems that Ligonie made a quality projector for the amateurs who wanted to sonorize their own films and that optical sound was a kind of extra. But that's only my guess. 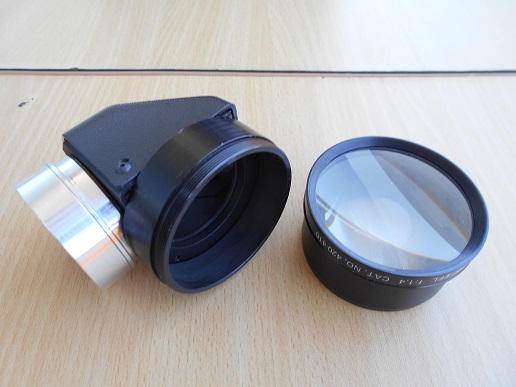 As I wrote before, you can easily put a reversing Lens on the Eiki lens that fits the Ligonie. It's of course far to be ideal but it's not bad. I presume you can also twist the film (like on other projectors) but that's certainly not something I would do myself or recommend. I have a 9.5mm conversion of an Eiki SNT-3 which I understand was done by a French firm. It can record onto magnetic as well play back. It also has conventional optical playback. All the optics are in the correct positions, so I can't see why Ligonie couldn't have done the same. 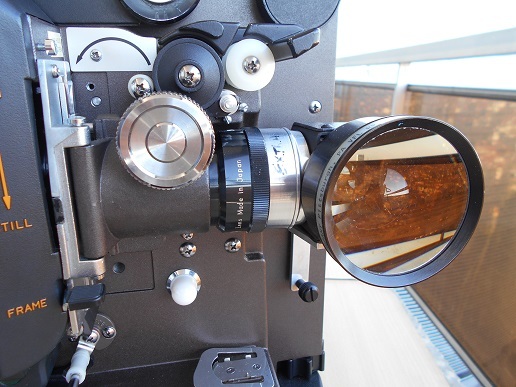 Grahame Newnham mentions that the model just sold is the MK1 model and was converted from the Swiss 16mm Bolex 521 designed by Microtechnica. It appears that this and the MK2 model may be subject to wear of their plastic worms. I have no idea why Ligonie did that. Someone paid 1810 EU, and may, or hopefully not, have trouble with the worm gear. I believe that Bolex might have some spares available. But have you seen their prices for spares? Dom, would you remember me how where are located magnetic and optical sound on 9.5mm films? You already had informed me, but I forget because I don't use the two formats. P.S. And also where the optical reader is mistakenly placed on this Ligonie. Luigi, when you put the spool on the feeding arm, the optical soundtrack is on the side that is close to you. The magnetic soundtrack is on the oposite side on more recent projectors and on the same side as the optical track on the oldest ones. Heurtier made (magnetic) soundheads for right or left tracks and Ligonie converted the Elmo ST 1200 projector to 9.5 with the possibility of reading both sides (someone told me that it happened after he had suggested to André Ligonie to introduce stereo on 9.5). Ah, so, this projector have the sound optics on the opposite side to yous when you put the spool on the feeding arm? But it's a serious thing! I think it's a fabric mistake, and at the beginning they did not think about the possibility of reversing the film and using a lens to do it! Ah, Ok, Dom, I remember this lens. Buckingham 9.5mm is a dream projector! Interesting, Dom. There had to be something "incomplete" behind the production of this projector. We hope to find other about it. These Italian made projectors OSM950 are actually the same machine made for Bolex being the model 521.16mm..Had one in for repair and although look good in appearance there not a good machine to work on as they have a similar nylon wormgear like the later B&H machines and very difficult to get,I had to get some made....worked out O.K in the end. Mike, so far, my projector runs perfectly. I'm aware of the weak gear but was told it was not difficult to find another one but since I have until now not had the need the look for a replacement one I don't know if they are more common in Europe than in your part of the world.